I love stuff. Accessories, accoutrement and adornment are some of my favorite words. More, more, more, pretty, pretty, pretty. No store left unshopped is my motto and you’d think I was part raven with my attraction to shiny things. Lately however, something has shifted for me and I want to feel unburdened by possessions. I think it may be the spring air. 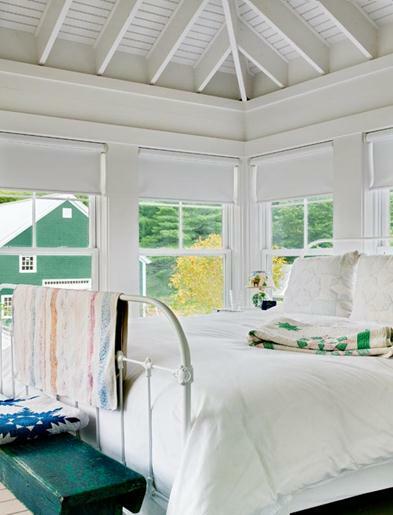 With the change in season, it’s time to throw open the windows, clean out the nooks and crannies and make everything new again. Gone are the layers of blankets on the bed. Fresh, crisp, clean and bright are my current adjectives. This room embodies the idea of fresh and clean. White walls, white bed, white duvet. Throw open the windows and you’re all set. Dreamy. Now for something a little more Scandinavian. If you’ve got a modern heart, this is the white room for you. Adding small touches of color in the form of a throw, some decorative pillows or even your favorite outfit will really pop on a canvas of white. Faux fur rugs can be a year round fixture in any room. Your feet will thank you. 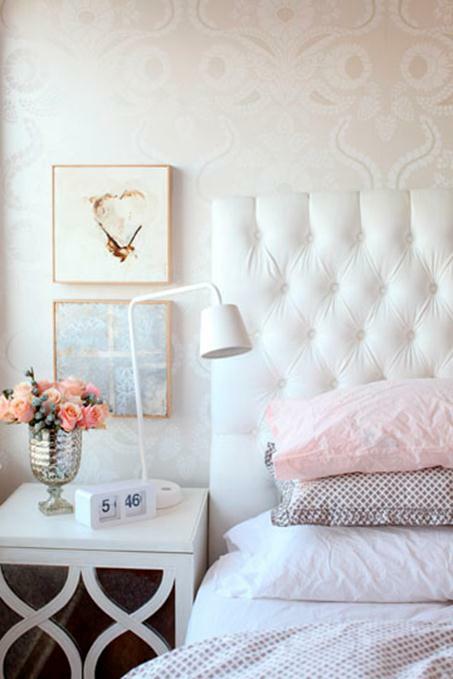 I love the textural juxtaposition of the crisp white tufted headboard and this elegant wallpaper. Don’t be afraid to mix and match white and off-white tones until you get a rich and pleasing combination. Your bedroom should be a haven for rest and relaxation. This season, try toning things down with white and limiting your accessories to the things you love most. May you have sweet dreamy dreams! 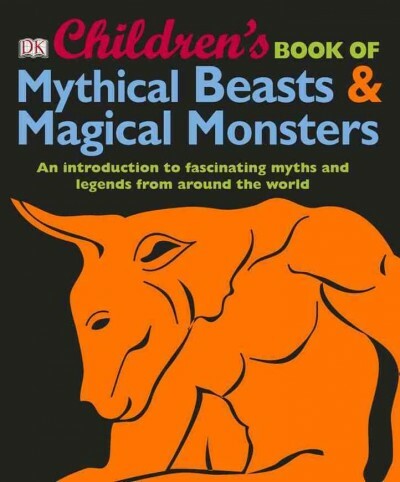 Children’s Book of Mythical Beasts and Magical Monsters by DK Publishing. What better image to carry off with you into your dreams than that of a witch’s house running around on chicken legs? Or the picture of human skin falling to the floor as the werewolf emerges? Maybe not everyone prefers these as their parting shots from consciousness, but I know one kid who is more than happy to. To be fair, not every story in here is scary or creepy. There are stories about Ananzi the spider, of African lore, or Native American tales of the Thunderbird which was, incidentally, my high school mascot. There are stories about tricksters from all corners of the globe, tales of the underworld, heaven, and everything in between. If you dig the Greeks, you’ll find them here as well. Aztecs more your thing? Look no further! Full of original illustrations as well as historic art from around the world, this is a great introduction to mythical creatures as well as stories of quests and battles. Now some of this book is rather creepy, so if you are not into spooky stuff, you may want to put this away until you are a little bit older. But if you like a little shiver, then by all means pick this one up! Five weekends in a row have been taken by blizzard winds and piles of snow. I know my state is not alone in this pattern. And I know I am not the only person waiting for the world to defrost so my family and I can get outside. I swear, next year we are taking up a winter sport just to keep cabin fever at bay. Until it’s safe to head outside for a hike that doesn’t require ice crimps, I’m determined to bring some nature into our bedroom. 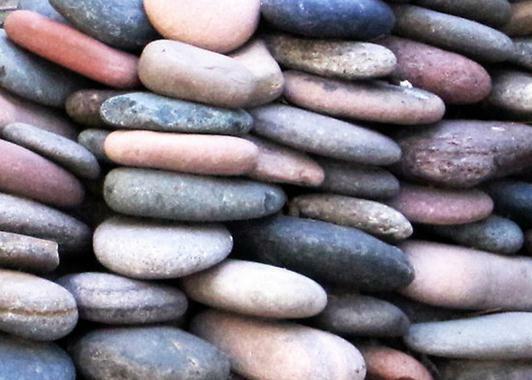 Place a few of the rocks my son gathers for me into one of the corners of the tub. That way I can place them under the water and pretend that I am in my kayak. Instead of a regular houseplant, I think a Tabletop garden could be fun. 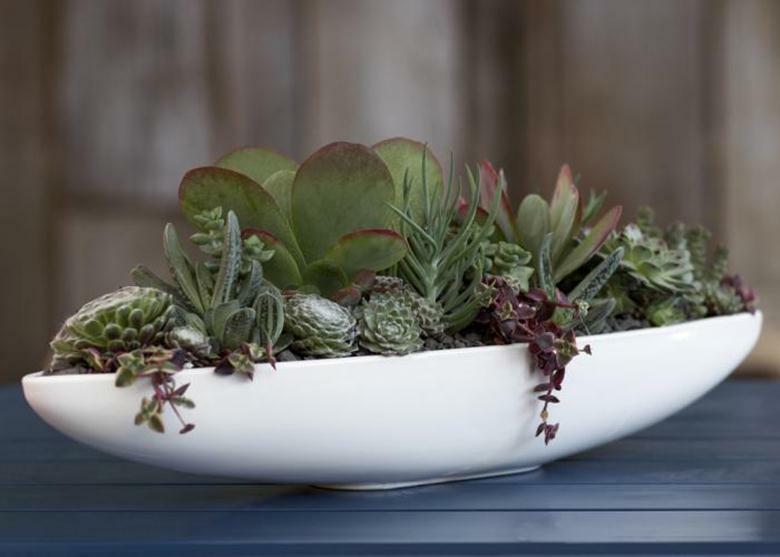 To learn more about indoor gardening check out Michelle Slatalla’s blog. I lived in Sweden for a couple of years. Not only did I pick up the habit of turning my face to the sun and basking in its warmth every chance I get, but, I also fell in love with Easter Branches. Not to be confused with Easter Brunches. 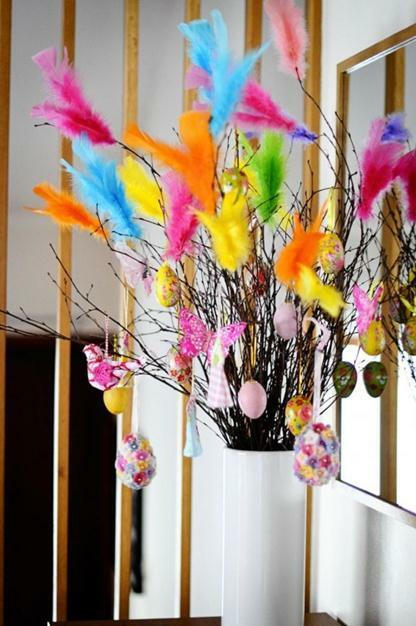 You gather branches, glue feathers on them and then hang wooden eggs, small birds and anything else that strikes your spring fancy. Having one of these in creations in your bedroom is a good reminder that even if the groundhog was wrong about how long it would take, spring will still arrive soon. Caution! Your secrets are not safe with me. I have been known to sneak into restaurant kitchens and accost people in grocery stores in the quest to uncover their families’ culinary treasures. 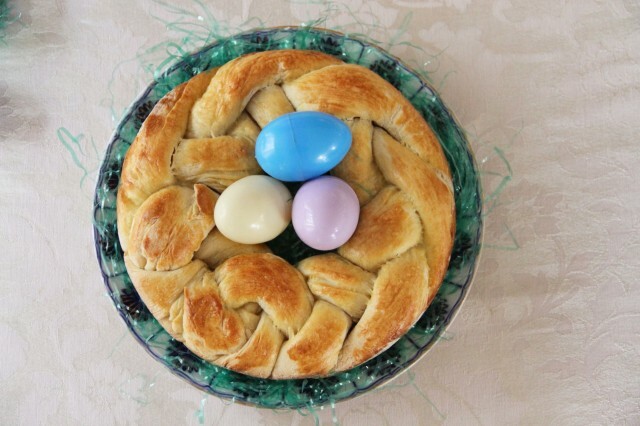 I finagled this delightful Easter Bread recipe from a trusting soul encountered while getting a mani / pedi. It was quite impressive how my new friend remembered the ingredients and quantities. I silently recited the instructions over and over until my nails dried, then raced home to jot them down. This method of bread-baking intrigued me. Normally, one would let the yeast activate, unmolested, while readying the remaining ingredients. I worried that the bread would not rise properly with too much disturbance of the yeast. 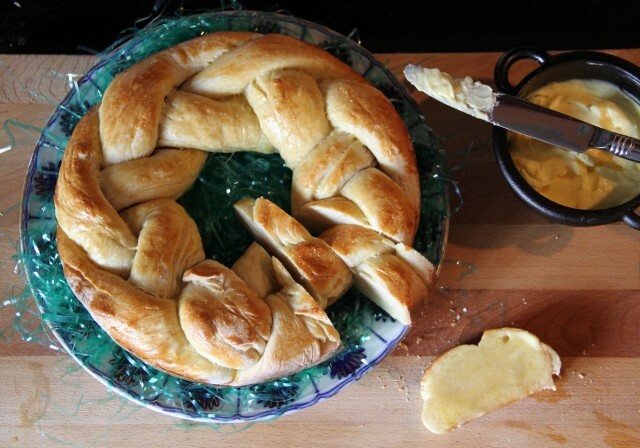 This recipe also calls for no second rise of the dough, another surprise. Nevertheless, after fiddling with the methods and metrics (my silent recitations may have been flawed), I managed to produce a lovely golden braided ring. Lightly sweet and dense with a hint of vanilla, this stolen Easter Bread is pure pleasure when warm and daubed with butter. Jazz it up by tucking a few colored eggs into the center of your circle – a lush adornment for your holiday table, or your breakfast tray. Add two cups of flour to food processor. Sprinkle yeast on top of flour. 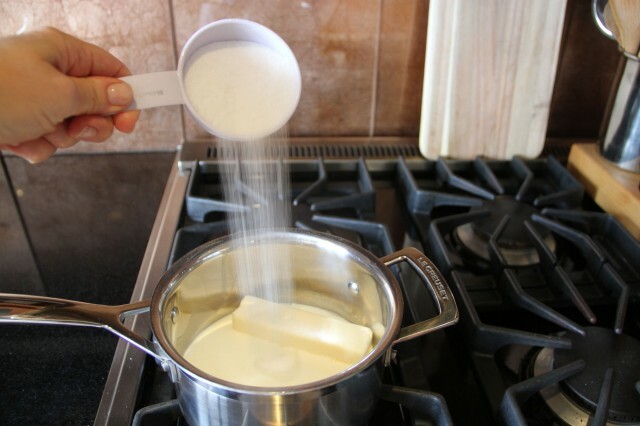 Put milk, butter, sugar and salt into heavy saucepan and heat over medium heat until just melted. Pour milk mixture into food processor and pulse a few times. Add two eggs, vanilla and remaining 2¼ cups of flour to food processor. Pulse until dough starts to ball and pulls away from sides. Turn dough out onto floured board, and separate into three equal pieces. Roll and stretch each piece into a long rope, about 30 inches long. 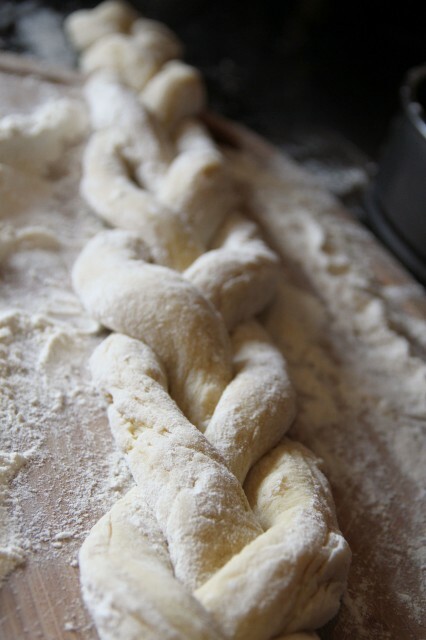 Loosely braid dough ropes into a circle, and place in a circular pan (I use a 10-inch diameter cake pan). Allow to rise in a warm place, covered, for about one hour, until almost doubled in size. Beat remaining egg and lightly brush over top of risen dough. Bake at 350° for 25 to 30 minutes until golden on top. Tuck a few colored eggs in the center of the ring, if you like. Let cool at least 20 minutes before slicing. Last week, we introduced you to our upcoming campaign to raise money and awareness for victims of Hurricane Sandy. Since today marks the official start of the campaign, we want to share some more information about the cause, and what you can do to show your support. 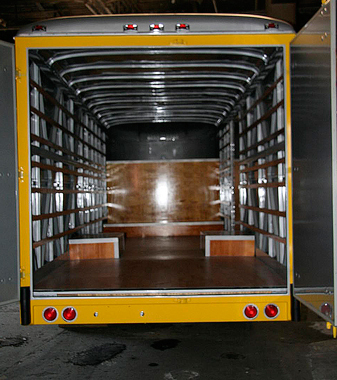 The Big Yellow Truck is a big component of our Hurricane Sandy Campaign Relief campaign, and we want to share a little more about what the Big Yellow Truck is. Charles P Rogers’ big yellow truck is actually a big yellow bus. 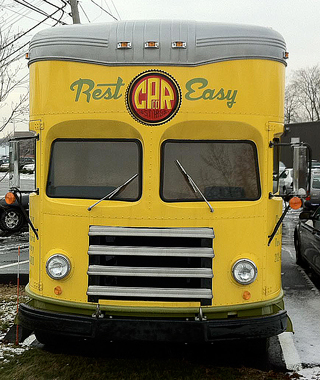 Originally manufactured by Fageol Motors, The Big Yellow Truck started out as a 1953 Twin Coach and has since been restored and repurposed into a Charles P Rogers icon. Doesn’t she look great!? If you see the truck parked in the city, don’t be afraid to stop by and check it out. In addition to getting up-close and personal with this sweet vintage ride, Charles P Rogers also donated $1 to the Red Cross – Jersey Coast Chapter for every picture of visitors with the truck tweeted or RT CharlesPRogers. 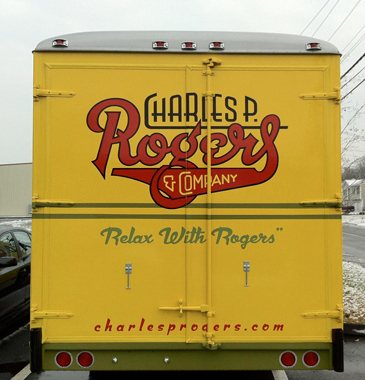 &#160;You can follow <a href="http://www.twitter.com/charlesprogers">CharlesPRogers on Twitter for updates on where you can find The Big Yellow Truck in the city. As part of our Hurricane Sandy Relief Campaign, Charles P Rogers brought the Big Yellow Truck to Architectural Digest’s 12th Annual Home Design Show. It ran from Friday March 22 – Sunday March 24. It was located at Pier 94, 55th Street at Twelfth Avenue. At the AD Home Design Show folks not only have a great photo op with the Big Yellow Truck, but they got to explore some of the latest products and trends emerging in the world of home design. With over 420 exhibitors representing 500+ brands, thousands came to find inspiration for your next home design project. We can’t wait to check it out! You can get more information about this event here. Stay tuned next week for more updates on The Big Yellow Truck and what you can do to support the Hurricane Sandy Relief Campaign.